From horseback to helicopters, see the icon like never before. Today the 45-foot-tall, 350-foot-long sign is in its best condition ever, thanks to the ongoing preservation efforts of the Hollywood Sign Trust. 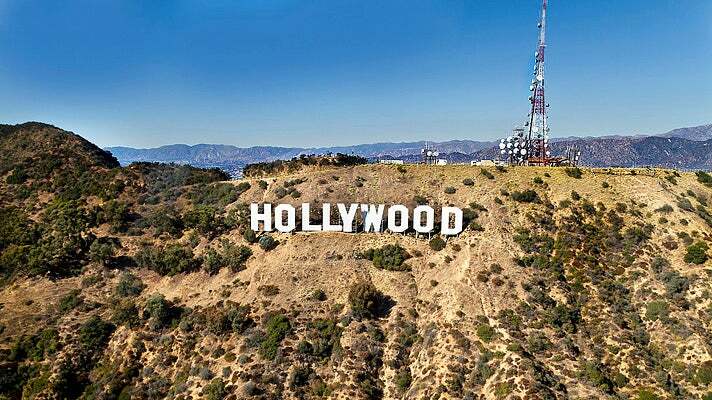 From hiking trails to unique views on horseback and even in a helicopter, read on for the best ways to view the world-famous Hollywood Sign. 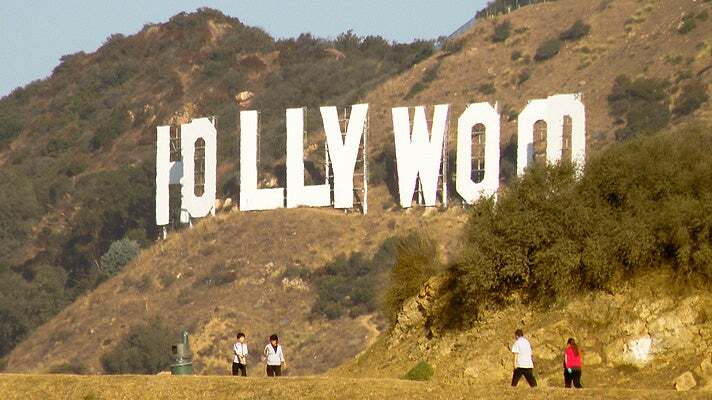 Wondering how to get to the Hollywood sign? 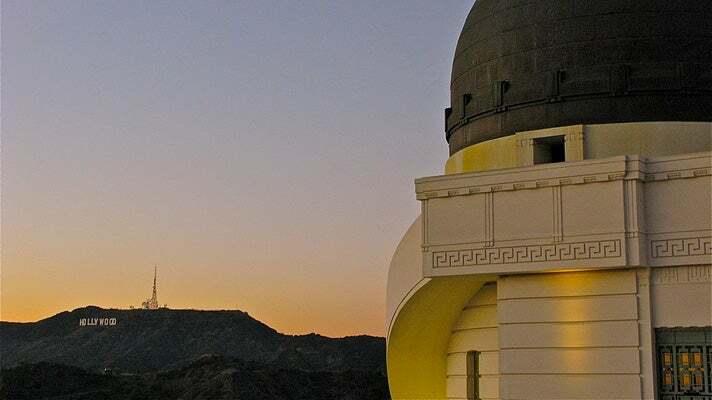 The DASH Observatory Bus offers convenient transportation to two L.A. icons, the Griffith Observatory and the Greek Theatre. The service runs seven days a week — even on Mondays, when the Observatory is closed. Connect to the DASH Observatory bus via the Sunset/Vermont Station of the Metro Red Line. The DASH Observatory Bus runs every 20 minutes Monday through Friday from noon to 10 p.m. and on weekends from 10 a.m. to 10 p.m. Board at the northeast corner of Vermont/Sunset. DASH fare is $.50 if you pay cash, or $.35 with TAP card. Rides are free through June if you have a Metro 7-day or 30-day pass! In 2010, Hugh Hefner came to the sign's rescue again. 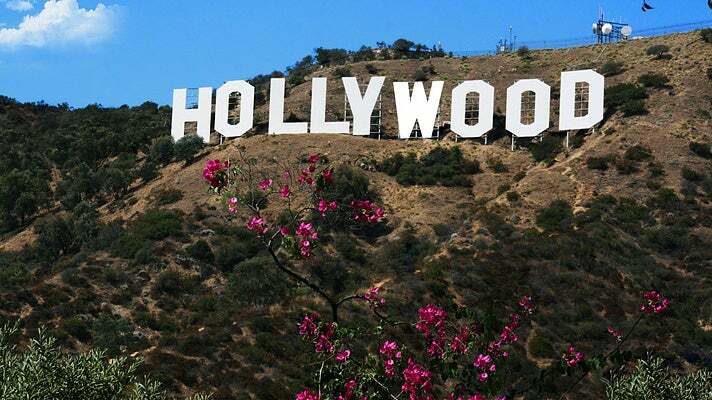 Thanks to a $900,000 donation by Hef, a $12.5 million fundraising goal was met and the area around the Hollywood Sign was saved from developers. The 138-acre parcel became part of Griffith Park, preventing any construction that would affect the world famous view. So it's only fitting that from here there’s a great Hollywood sign viewpoint just a short distance from the parking lot of the historic Griffith Observatory. Just walk along the railing on the right side of the lot for a great view. And if you're looking to make the most of your trip, take advantage of the free admission to the Observatory, which re-opened in 2006 after an extensive, four-year renovation. 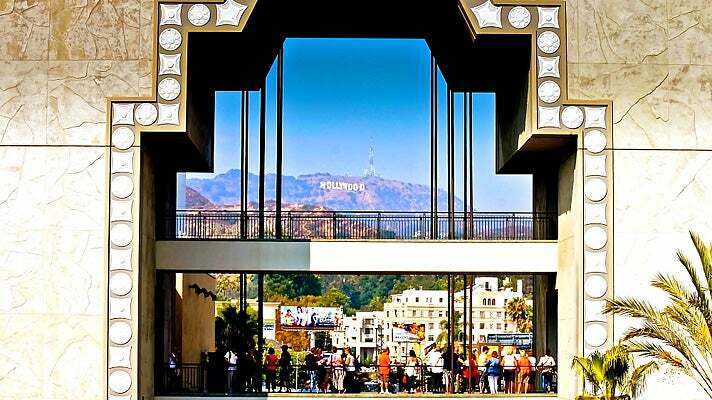 The easiest way to catch a photo opportunity is from the famed Hollywood & Highland. With a design inspired by the D.W. Griffith film, Intolerance, the shopping and entertainment complex also houses the Dolby Theatre and the TCL Chinese Theatre. There are multiple areas throughout the structure that are actually dedicated to visible views of the famed sign. While you're there, you can also browse major retail stores and dine at one of the many restaurants in the center. 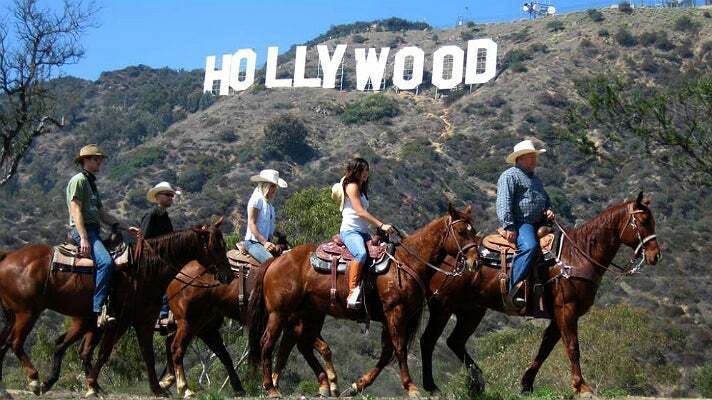 If you enjoy horse-back riding, you will relish the experience of a guided trail ride from Sunset Ranch Hollywood, the only horse ranch in greater Los Angeles. Centrally located in the beautiful Hollywood Hills, with the sign above and Griffith Park nearby, Sunset Ranch offers a variety of services and activities, from guided trail rides, boarding, and lessons to its famous Sunset Dinner Rides. In the 1920s, the film industry came to Los Angeles to take advantage of the sunny weather and scenic locations, especially for Westerns. A piece of that Hollywood history can still be found at Sunset Ranch, which is by far the best place to view the Hollywood sign while riding into the sunset. 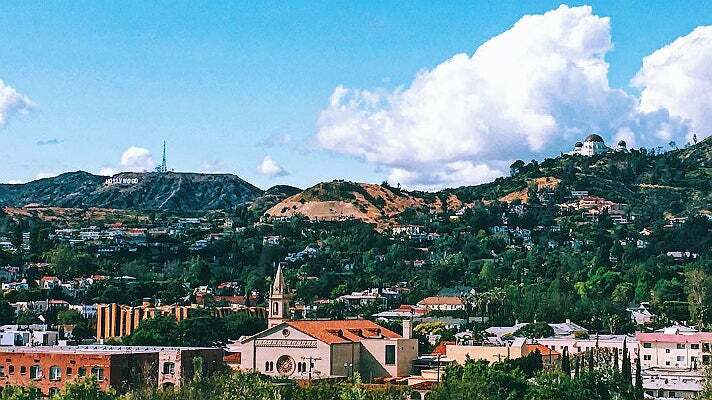 Located near the intersection of Hollywood Boulevard and Vermont Avenue, Barnsdall Art Park sits on 11 acres atop Olive Hill, offering breathtaking views of the city and the Hollywood Sign right near the Griffith Observatory. The site was deeded to the city of Los Angeles in 1927 as a cultural art center. Today, it is home to the Frank Lloyd Wright-designed Hollyhock House, the Los Angeles Municipal Art Gallery, the Barnsdall Art Center, the Junior Arts Center, and the Barnsdall Gallery Theatre. Popular seasonal events at Barnsdall include Friday night wine tastings on the Hollyhock lawn, Saturday night outdoor movies, outdoor yoga, and Sunday art workshops. While the hiking route will be the most physically rewarding way to view the sign, an air tour will undoubtedly prove to be the most extravagant - not to mention the most stylish. Flying out of the oceanfront heliport at the Queen Mary in Long Beach, IEX Helicopters takes passengers up close for the best view of the Hollywood sign, soaring over landmarks from the coast to the skyscrapers of Downtown L.A. Group 3 Aviation offers a 30-minute "Hooray for Hollywood Tour," or a 45-minute flight that combines Hollywood and the beach. You can also "Fly & Dine," a tour that starts with dinner at the 94th Aero Squadron restaurant in Van Nuys. You can also fly with Star Helicopters, which will allow you to view the sign in both its "Star VIP" tour or the shortened "Hollywood and More" tour for those who don't want to commit to the entire city. And for those who want to celebrate a special occasion while getting up close, Orbic Air has you covered, with specially themed packages for upcoming holidays. It is hard to imagine Los Angeles without the Hollywood Sign. Now you have all the tools you need to see this piece of history from multiple vantage points - including from above. Whether you're in the mood for a hike and an up-close view, or a unique view from the saddle, the way you see this world famous, historic landmark is completely up to you.